Historicist: "We Are Confident That Victory Is in Sight." 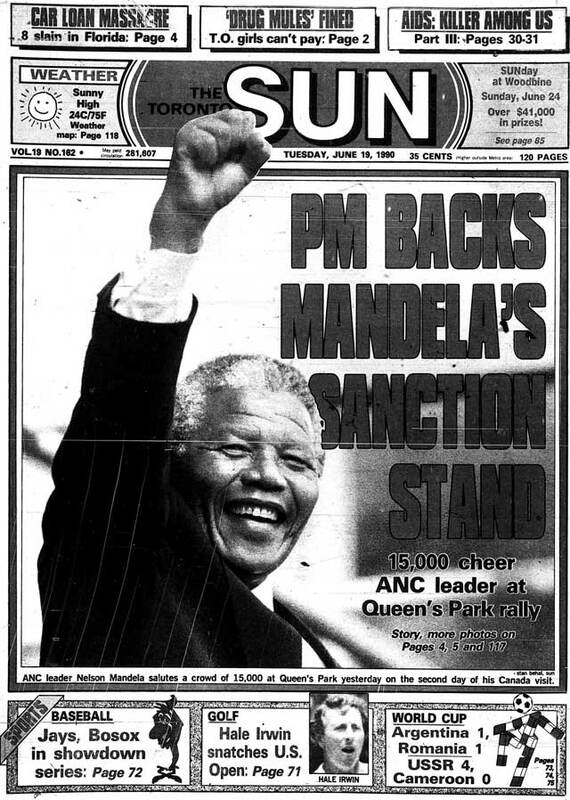 Front page of the Toronto Sun (June 19, 1990). At first glance, the space above Asteria Souvlaki Place at 292A Danforth Avenue drew little attention to itself. Until February 11, 1990, its occupants were happy to keep it that way. Not advertising to the world that this was the local office of the African National Congress (ANC) was intended to protect staff from potential harm. 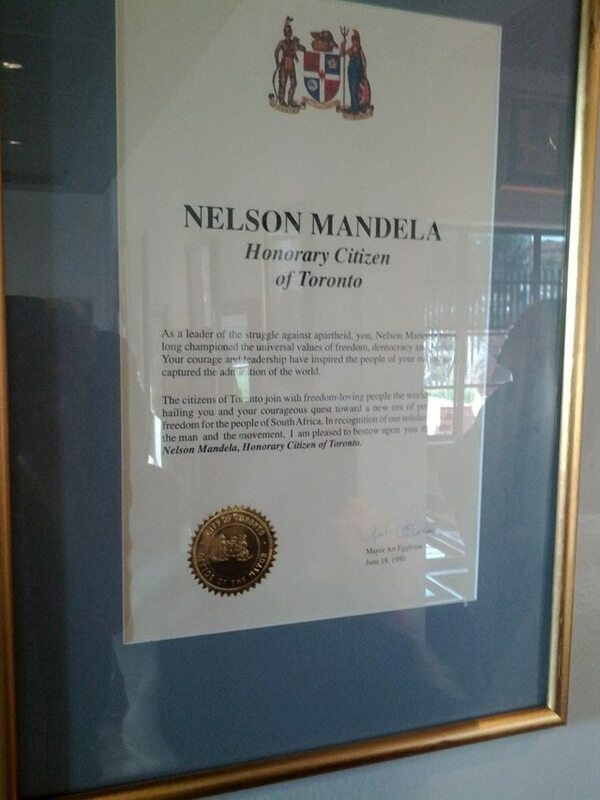 When word arrived that day from South Africa that Nelson Mandela was free after over 27 years of imprisonment, 292A Danforth went public by offering itself as a place for Torontonians to celebrate the news. 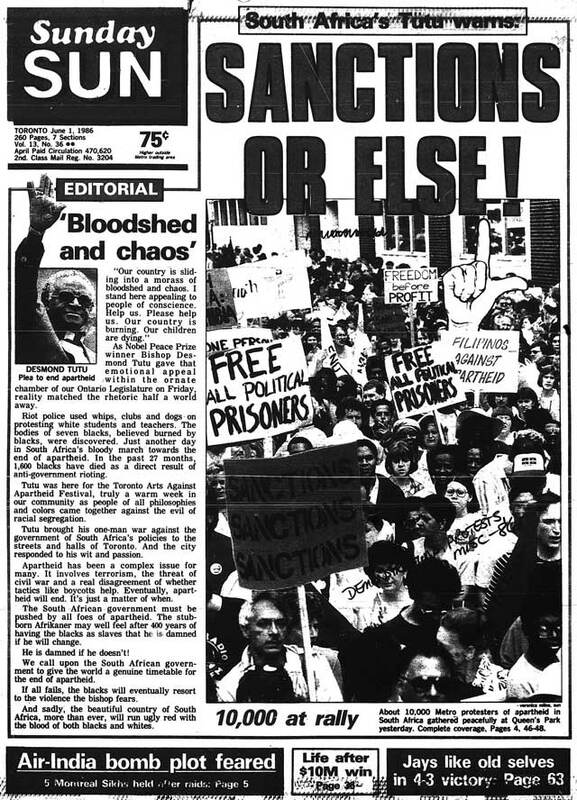 Mandela’s release was viewed as a positive sign in the battle against South Africa’s apartheid policy, a fight for which Toronto was a hotbed of activity during the 1980s. Boycotts and divestitures of holdings in companies with ties to South Africa became the norm for educational institutions. Protests targeted businesses that continued to operate in the increasingly demonized country. The Toronto Board of Education organized annual anti-apartheid conferences for high school students. Front page of the Toronto Sun (June 1, 1986). The first scheduled stop was a rally at Nathan Phillips Square, but the grueling pace of the tour—eight public speeches during his 50 hours in the country—caught up to Mandela. While he rested at a hotel, Winnie took his place outside City Hall. She was greeted by dancers, ANC flags, and a crowd of 8,000. Though some people were teary-eyed not to see Mandela, Winnie assured them he would be on hand for a 6 p.m. speech at Queen’s Park. She received an Ojibwe talking stick which, according to the Sun, she could “knock with until South African President F.W. DeKlerk opens the door for the democratic process for all of South Africa.” Vendors in the square enjoyed steady business selling clothing and other Mandela souvenirs, which irritated some attendees. Scarborough teenager Tricia Jarrett told the Star that she came “to see a great man, and here they are, profiteering.” This didn’t stop her from buying a $15 T-shirt. Following a parade up University Avenue, Mandela spoke to an estimated crowd of 30,000 people at Queen’s Park. He received honorary citizenship from Mayor Eggleton, who was booed by the crowd. Other speakers, such as activist Dudley Laws and provincial NDP leader Bob Rae, received a warmer welcome. 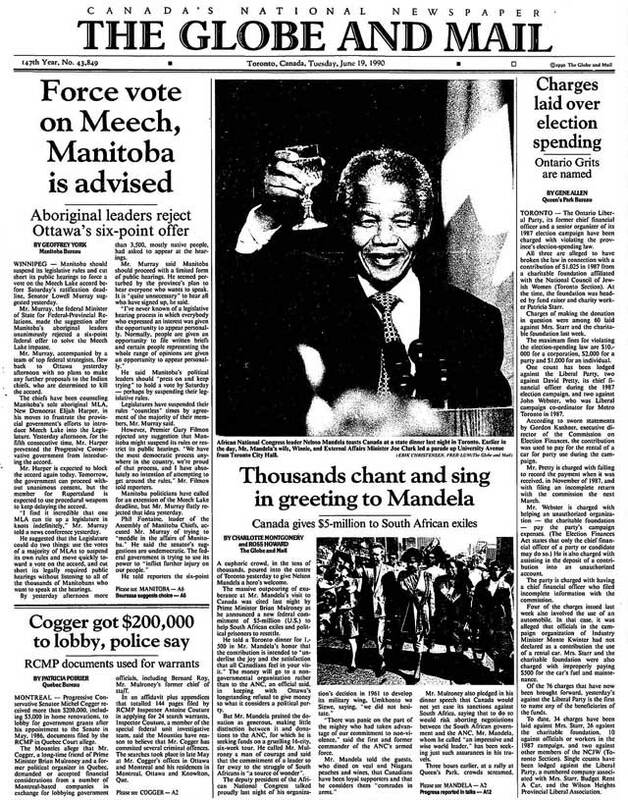 Mandela gave a half-hour speech thanking Canadians for their support in fighting apartheid over the years. “We are confident that victory is in sight,” he reflected. “But as in a steeplechase race, the last hurdles are the most difficult to overcome. As we enter the last lap, we call on the people of Canada to gather and redouble their efforts and endeavors in support of our struggle.” As he spoke, fists rose amid the crowd as they chanted his name. Some attendees took extraordinary measures to see Mandela speak—a heart patient from Cochrane signed himself out of Toronto General Hospital to attend. Front page of the Globe and Mail (June 19, 1990).